Brandon Belt stepped up to the plate in the eighth against Cardinals closer Jason Motte. It wasn’t the game situation that Motte was hoping for. And the result wasn’t what he was hoping. Belt sent a towering home run to right center. It was the biggest blast of the night for the Giants. And yet, they won 9-0. The Giants learned a lesson that they needed to learn all season. Good things can happen when you put the bat on the ball. No one taught the lesson better than Marco Scutaro. But the Giants didn’t exactly tattoo Cardinals starter Kyle Lohse. They killed him with 1,000 pin pricks, and the Cardinals defense didn’t help him out either. First inning, Angel Pagan leads off the game by singling to right (So huge to get that first hit out of the way). Then the Giants do the hit-and-run with Scutaro, who laced a pitch to right and Pagan took third. The next three hitters didn’t get the ball out of the infield, yet Pablo Sandoval’s bouncer back to Lohse was enough to get Pagan home. Giants 1-0. Second inning, Gregor Blanco lines a one-out single to right and advances to second on a Brandon Crawford groundout to first. Then Matt Cain shoots a single to center, scoring Blanco. It was the third consecutive game a Giants pitcher recorded an RBI. And it was another example of sloppy defense. Running on contact with two outs, the speedy Blanco should have scored easily on a single to center. But because it was the pitcher batting, center field Jon Jay was playing shallow. He got to the ball just as Blanco was rounding third. A strong throw would have made for a close play at home. It was not a strong throw, and it was cut off before reaching the plate. Giants 2-0. Third inning, Scutaro lines another single to right (what else is new) on the first pitch of the innng. On the second pitch, Sandoval lined a double to left. Buster Posey walked to load the bases and Kyle Lohse was done. In comes Joe Kelly. Then came maybe the weirdest double in NLCS play. Off the bat, Hunter Pence hit what looked like it might be a double-play ball when he got his bat broken by a Kelly fastball. Slow-mo replay actually showed the broken bat making contact with the ball THREE TIMES. The spin on the ball made shortstop Pete Kozma break to his right, then the ball looped to his left and into center, scoring Scutaro and Sandoval. Jay came up to field the ball, but mishandled it, and Posey scored all the way from first. It didn’t end there. The Giants would add two more runs on three balls that didn’t leave the infield. Belt hits a chopper back to the bound that a jumping Kelly deflected with his pitching hand. By the time second baseman Daniel Descalso field the ball, Belt was safe a first. Then Blanco walked to load the bases … again. Brandon Crawford hit a slow chopper that Kozma charged and fielded. His only play was to first, yet he tried to force Pence out at home. No chance. Pence scored, and the bases were still loaded. After Cain struck out, Pagan hit what again looked like a double-play ball. But Kozma’s underhanded toss to Descalso was high, forcing Descalso’s throw to first to be low and Pagan beat it out, scoring Blanco. Scutaro walked to load the balls … again … before Sandoval ended the inning with a line out to first. Giants 7-0. 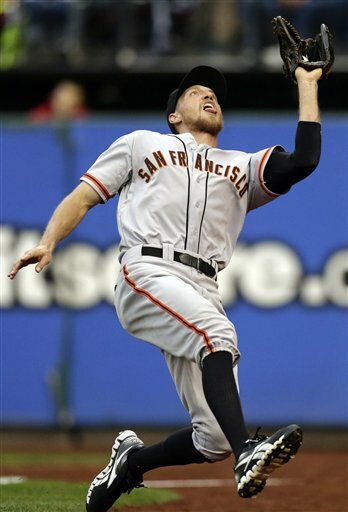 The Giants added an eighth run in the seventh inning on a run-scoring double play by Aubrey Huff. Sorry, Aubrey, no RBI. And then a ninth run on Belt’s homer in the eighth. The rest of the work was done by the pitching. Cain’s outing looked more like his 2010 postseason, allowing no runs on five hits and one walk in 5 2/3 innings. The reaction shot of the night was when from Cain when manager Bruce Bochy came to relieve him after Cains struck out David Freese for the second out in the sixth. “NOW?!?! ?” Cain said. Tim McCarver read his lips as saying “No!! !” But McCarver was wrong, as he often is. But after 102 pitches, Cain had done enough. Jeremy Affledt pitched the next 1 1/3 innings, giving up no hits and one walk. Santiago Castilla got the first two outs in the eighth while allowing two hits. Javier Lopez came in to end the eighth. He got two more outs in the ninth, but also walked two as he struggled with his footing on the mound in a raging downpour. Bochy went and got Sergio Romo to get the final out, which he did by getting Matt Holliday (fitting) to pop out to Scutaro (even more fitting). And the Giants were singing … and dancing … in the rain. Searching for some Game 7 karma? How about ‘Giants Monday’? After Sunday’s Game 6 win over the Cardinals, I went searching for some kind of karma, some signal that would tell us the Giants would prevail in Game 7. I tried looking for Game 7 history. But the Giants haven’t played a Game 7 at home since 1962, and only played two other Game 7s since then … and lost both. I tried looking for clinching games at home. But the Giants’ last four playoff series clinching wins have come on the road. They’ve only played three potential series clinching games at home since 1962, all Game 5s: 1989 vs. Cubs (won), 2002 vs. Cardinals (won), 2010 vs. Phillies (lost). But then, it hit me … Monday. 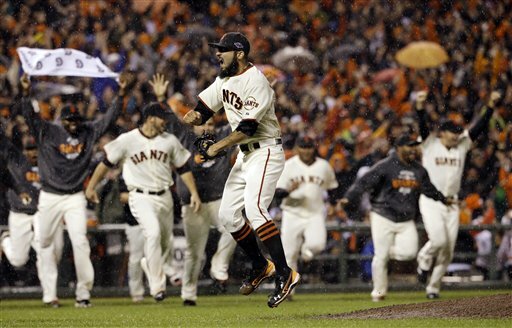 Mondays have been very good to the San Francisco Giants in the postseason. The San Francisco Giants have NEVER lost a postseason game played on a Monday — a streak of seven consecutive wins. Five of those wins clinched the series for the Giants. The last time the Giants lost a postseason game on a Monday was Game 4 of the 1951 World Series, when they were the New York Giants. Now some might point to the 1998 one-game playoff for the wild card spot against the Cubs, which the Giants lost 5-3. But that wasn’t a postseason game. Officially, it was regular-season game No. 163. And “Rainy Days and Mondays” always brought The Carpenters down. But the San Francisco Giants LOVE Mondays. Wait a minute. Mondays always bring The Carpenters down? The Cardinals have two Carpenters on their roster. 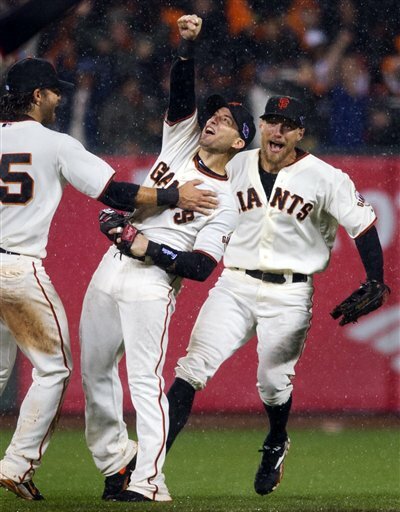 In 2010, the Giants captured the World Championship without facing an elimination game. 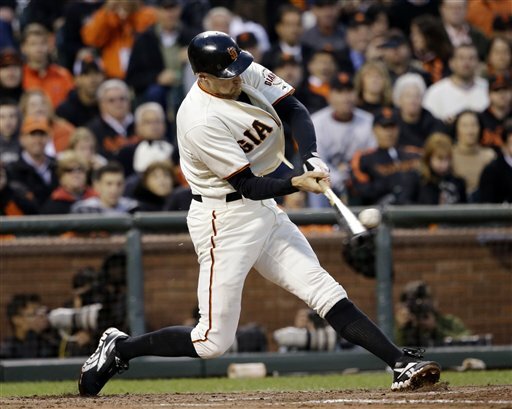 On Sunday, the Giants’ faced their fifth of the 2012 postseason. Thanks to Ryan Vogelsong, they’ll face their sixth on Monday. For the second time in this series, Vogelsong limited the Cardinals to a single run over seven outstanding innings of work. Following up the effort of Barry Zito in Game 5, Vogey even delivered an RBI to his cause as the Giants won 6-1 in Game 6 Sunday, forcing a deciding Game 7 on Monday. Vogelsong set the tone early, striking out six of the first seven batters he faced. Then the offense did its part by giving him a 5-0 lead before Vogelsong would face the eighth Cardinal. “I just tried to do really the same thing (Zito) did, come out and set the tone early for us,” Vogelsong said, referring to Zito’s performance in Game 5. And he did, with the bat as well. The Giants struck first with a run in the bottom of the first. After a walk to Marco Scutaro and a double by Pablo Sandoval, Buster Posey’s infield grounder scored Scutaro with the first run. In the second, with Brandon Belt on third and Brandon Crawford on first and one out, Vogelsong squared to bunt with Crawford taking off for second. Then Vogelsong pulled the bat back and hit a slow grounder to short. Cardinals shortstop Pete Kozma, who had broken to cover second, changed direction to field the ball and dropped it, as Belt scored and the other two runners were safe. After Angel Pagan struck out, Scutaro delivered another clutch hit, doubling to left to score Crawford from second and Vogelsong from first. After Sandoval added an RBI single to make it 5-0 in the second, it was the Cardinals who looked like they were out of gas. 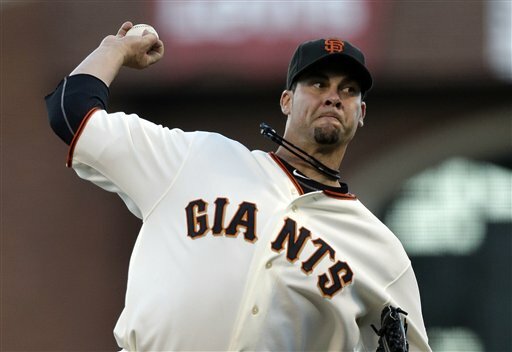 Vogelsong kept going on strong, not allowing a hit to the Cardinals until the fifth inning. The final numbers for Vogelsong: 7 IP, 4 hits, 1 ER, 1 walk and 9 strikeouts. For the postseason, Vogelsong has given up three runs on 11 hits in 19 innings, for a 1.42 ERA. And now it’s down to one game, as the Giants comeback magic continues. They were down 0-2 to the Reds, needing to win three on the road to survive, and they di. They were down 3-1 to the Cardinals, needing three wins to surviving, and they have achieved two of them. Well, the Giants aren’t alone in that description. With Sunday’s win, the Giants became the eighth team to win five consecutive elimination games in postseason history. Three other teams have also won five: the Red Sox in 2007-08, the Dodgers in 1981, and the Athletics in 1972-73. If you want good karma, all of those teams won World Series titles, except the 2008 Red Sox. But to join those world champions, the Giants will have to win a sixth. And that would put them in a class with four other teams to win six in a row: the Tigers in a streak that extended from 1945 to 1972, the Twins in a streak that extended from 1987 to 2002, the 1985 Royals … and these Cardinals, who have six in a row dating back to last season. 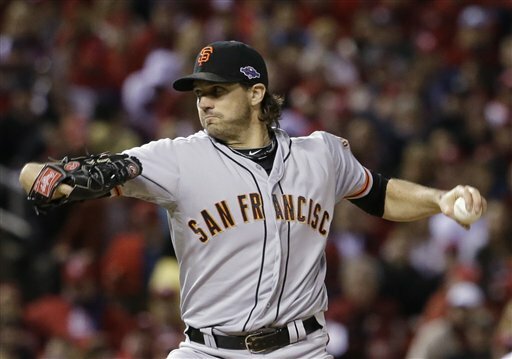 Barry Zito rescues the San Francisco Giants ….. again? I didn’t blog after the Giants’ 8-3 loss to the Cardinals on Thursday — not entirely because I was depressed. I was actually busy with other things. But if I had found the time to blog, this is what I was planning to write. All hope was not lost, not even with the fact the Giants were behind 3-1 in the National League Championship series, needing once again to win three consecutive games to advance. And not because Barry Zito was pitching. Jayson Stark of ESPN said Wednesday that Game 3 was the game the Giants NEEDED to win, because Matt Cain was on the mound. After Cain came the enigmatic Tim Lincecum (he was right about that one) and then the equally puzzling Barry Zito. But as someone who has blogged about the Giants all season, I kept thinking back to similar feelings I had about upcoming Zito starts this season. The situation was this: the Giants were coming off a loss — sometimes a couple of losses — and, oh great, now Zito is pitching. Then Zito turns in a pearl. Seven of Zito’s 15 wins this season — that’s almost half — have come on days that followed a Giants’ loss. It started with his first win of the season way back on April 9. You remember? Zito was gawd-awful in the spring, stayed in Arizona to “work on some things,” the Giants drop their first three games to the Diamondbacks, then they get Zito pitching in Colorado. And what did he do? He pitched a shutout, being the Rockies 8-0. Well, Zito did it again on Friday, when the stakes were far higher than they had ever been previously. He held the Cardinals to no runs on six hits and one walk (which was an intentional walk) while striking out six in 7 2/3 innings, sending the Giants back to San Francisco with the hopes of a pennant still alive. Afterwards, Zito knew what the victory meant to him and his team. And as they have so often this season, the Giants did something for Zito. They got him some runs. For the second time in this NLCS, the Giants went hitless against Cardinals’ starter Lance Lynn the first time through the lineup. And for the second time in this NLCS, they jumped on him for a four-run fourth inning. Marco Scutaro and Pablo Sandoval opened the inning with singles before Buster Posey struck out. Hunter Pence hit a high chopper back to Lynn, who fielded the ball, spun and threw to second. But the ball was low, shortstop Pete Kozma was late in covering, and the ball bounced off the bag and into the outfield, allowing Scutaro to score the game’s first run. After Brandon Belt popped out — failing to get a runner home from third with less than two out — Gregor Blanco walked. Then Brandon Crawford delivered in the clutch again, as he has before this postseason, smacking a single up the middle to score Sandoval and Pence. Then Zito made the offensive play of the night for the Giants. After falling behind in the count, he saw David Freese playing deep at third and punched a bunt up the third base line, then hustling down to first for an infield single that scored Blanco with the fourth run. The play stunned the Cardinals, and even some Giants, too. It wasn’t all Zito after that. Pablo Sandoval added another home run, and the Giants’ defense behind Zito was superb. 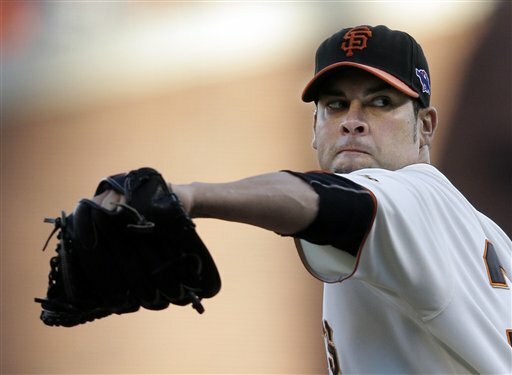 But the bottom line is that for the 13th consecutive game that Zito has started, the Giants came away winners. Now the Giants return home where they will throw Ryan Vogelsong in Game 6, and hopefully Matt Cain in Game 7. And here’s another amazing thought. If the Giants can pull off another comeback and advance to the World Series, who do you think might get the call at AT&T Park next Wednesday against the Tigers? Could it be Barry Zito? Oh, and the last time Zito faced the Tigers, he delivered his only scoreless start of the 2011 season, pitching six scoreless in Detroit on July 2, 2011. And the Giants scored runs for him, winning 15-3. OK, it isn’t time to panic. But it is time to become worried … at least about Hunter Pence. Pence repeatedly missed opportunities to deliver in the clutch as his woeful postseason at the plate continued. After going 4 for 20 (.200) with no RBI in the NLDS, he is now 1 for 11 with no RBI in the NLCS. That’s a whopping .161 for the postseason. The Giants’ biggest scoring threat came in the top of the third when Angel Pagan singled and Marco Scutaro slapped a double down the right-field line, putting runners on second and third and nobody out. Pablo Sandoval followed with a sacrifice fly scoring Pagan and sending Scutaro to third. The Cardinals then intentionally walked Buster Posey. Then Pence came up and grounded into an inning-ending double play. In the fifth with two outs, the Cardinals walked Posey again. Pence grounded out to short. In the seventh, Pablo Sandoval hits a one-out liner off the wall in left, but only managed a single. That angered many Giants, but it didn’t really matter. Because if Sandoval had doubled, the Cardinals would have simply walked Posey again. At least with Sandoval staying at first, Posey at least got a chance to swing the bat. He delivered a single to left, putting runners at first and second and one out. This time, Pence struck out. “I’m the goat tonight. I just didn’t get the job done,” Pence said. Well, there were plenty of oats to go around the Giants’ lineup. With runner at second and third and two out in the fourth, Angel Pagan flied out to center to end the inning. In the sixth, with two on and two out, Pagan grounded out to end the inning. In the seventh, after Pence struck out, Brandon Belt struck out looking. In the end, it was one run on nine hits and FIVE walks. The hole in the lineup that is Pence is making it easy for teams to pitch around Posey, who is being followed in the lineup by a guy who strikes out swinging too much and then a who strikes out looking too much. The guy who strikes out looking might find himself looking from the bench in Game 5. Bruce Bochy said he would consider lineup changes for Game 5. Bay Area media members said that would likely include Hector Sanchez catching and Buster Posey at first base. I doubt we’ll see a lineup with Pence hitting seventh. It’s not Bochy’s style. But some kind of shakeup is needed right now. Prior to Game 5 of the NLDS in Cincinnati, Giants broadcasters Duane Kuiper and Mike Krukow were talking about superstitions. 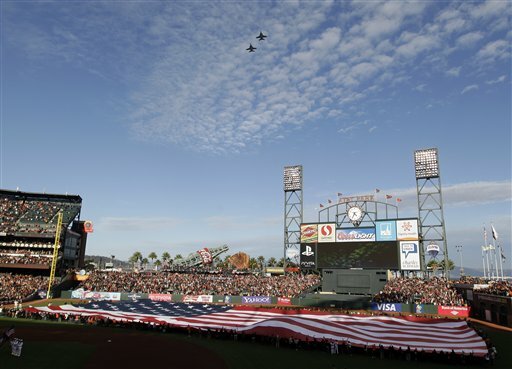 Krukow talked about going through the same routines, even taking notice that fans walking to the park appeared to be wearing the same clothes as the previous day. Now, I’ll admit to sticking to certain rituals when watching the Giants. In 2010, during Game 4 of the World Series, I put on my Giants garb as part of my Halloween costume … as it was Halloween. After the Giants won Game 4, I put on the same clothes for Game 5. In fact, I also sat in the same chair. And as I was folding clothes to burn nervous energy during Game 4, for Game 5 I held the same pillow case that I held through the later stretches of Game 4. For Game 1 of the 2012 NLCS, I watched the game from work … because I’m lucky enough to have a job that allows me to watch a baseball game while working. I listened on the MLB audio feed from KNBR on my computer while I watched the action on the TV … despite the fact that the TV feed was about eight seconds delayed from the audio play-by-play. Why? Because that’s what I did in 2010. In 2012, it didn’t work as well, as the Giants lost to the Reds. So, for Game 2, I moved my workspace so I can just watch the TBS on TV. That didn’t work either. Then I asked for the Giants to win Game 3, because I was going to off from work for Games 3 and 4, and I wanted to be able to watch two more games from home. The Giants won Game 3, and Game 4. Game 5 was played in the morning on the West Coast, meaning I could watch it from home before going to work. And the Giants won again. So I started thinking that there might be a correlation: Lose when I watch from work, win when I watch at home. With Sunday another work day, I actually thought about going into work early, getting some things done, then going home to watch the game. (My job allows me that flexibility, too). But I thought “Naaah. That’s silly.” So I went to work, and watched the game from there. And the Giants lost. On Monday, I was off from work. So I watched the game from home, albeit on a two-hour delay on the DVR because of another evening commitment. And the Giants won. So, that fact made me look at my work schedule and the remainder of the NLCS. On Wednesday, Game 3 is slated for a 1:07 p.m. PDT start (3:07 p.m. CDT). Perfect. I work Wednesday, but wouldn’t need to go into work until after the game. But there’s one problem. Rain is in the forecast Wednesday in St. Louis. The forecast for game time Wednesday calls for a 70 percent chance of thunderstorms. It climbs to 80 percent by 4 p.m. CDT and 5 p.m. CDT. Then it drops to 70 percent at 6 p.m. and 50 percent by 7 p.m. The forecast for 9 p.m. CDT (7 p.m. PDT) is 20 percent chance of rain and partly cloudy. So the chances of the game being completely scrubbed on Wednesday seems unlikely, unless the rainfall is so heavy or lengthy that it leads to wet grounds. But if the game doesn’t start until 6 p.m. or 7 p.m. PDT, well then I’m stuck at work. Ryan Vogelsong stopped the streak. Several streaks in fact. And in doing so he kept another streak going. The first streak that ended was the Giants’ three-game losing streak at home in the postseason, and that evened the NLCS at one game each. He helped end Chris Carpenter’s streak of winning his last five postseason decisions. And by pitching seven solid innings, he became the first Giants starter to post a quality start in the postseason. Of course, Vogelsong could have ended that last streak in his last start had the Giants managed any early hitting in Game 3 of the NLDS. Vogelsong gave up one run in five innings against the Reds, when he was lifted for a pinch-hitter when the Giants were being no-hit by Homer Bailey. And this after a seven-start stretch in August and September in which he posted on ERA over 10.00. Angel Pagan gave the Giants the early lead with his second lead-off home run of the postseason. After the Cardinals tied the game 1-1, the Giants took control with their second four-run fourth inning in two days. Brandon Belt, who struggled in the NLDS, came up with a big double in the fourth, and moved to third on Gregor Blanco’s single. When Chris Carpenter made an error on Brandon Crawford’s chopper, Belt scored to make it 2-1. After a walk to Pagan, Marco Scutaro, who was hurt by a late slide by Matt Holliday in the first, delivered a two-run single and a third run scored when Holliday booted the ball in the outfield. The Giants added to more runs in the eighth when Ryan Theriot, who replaced the injured Scutaro in the sixth, delivered a bases-loaded single. Scutaro had X-rays after the game, which came back clean. Then he went to the hospital for an MRI. But the Giants got the win they needed. They need to win at least one in St. Louis to bring the series back to San Francisco. And who would pitch in that potential Game 6 in SF?